The black opening marubozu is a single candlestick pattern with a long black body, a lower shadow and the lack of upper shadow. The day opens and prices go below the opening price. Prices continue to move down all day thus forming the long black body. The closing price is below the opening price but not at the low of the day that creates the lower shadow. 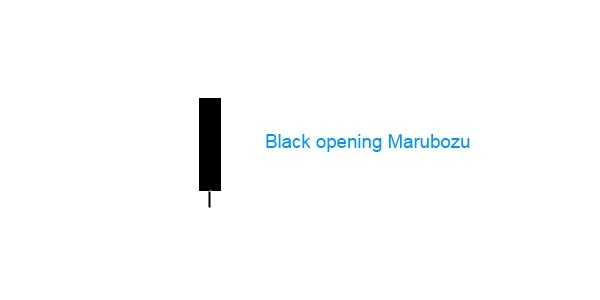 The black opening marubozu is a single candlestick pattern with low reliability. It only reflects one day’s trading and may be pointing either continuation or reversal. Hence it must be considered with other candlesticks to better judge the direction of the trend. The black closing marubozu could be part of a continuation pattern or of a trend reversal pattern, depending on the neighboring candlesticks. If the black opening marubozu forms during an uptrend, a bearish belt hold pattern appears.